Many people are now seeking natural solutions to their physical ailments. It is a good thing when a solution can be found which is less invasive and works with the body naturally. Drugs and surgery can be useful and powerful for the body. When these are chosen there is usually an immediate effect. Supplements, diet changes, massage, while more natural perhaps, often act more subtly in the body for a time. I remember struggling with eczema for most of my life and at one point my hands had swollen to twice their size. This was very painful and made me pretty disabled. My dermatologist prescribed drugs that returned my hands to normal within a day. I was so relieved until the drugs ran out and she couldn't refill them. I had to struggle with creams from then on which weren't working very well. I switched to a naturopathic doctor who gave me supplements and a diet change. It took about a month on this regimen, but everything calmed down. And now that I have added some supplements permanently I don't have the problem at all anymore. During that month with the naturopathic doctor I had many moments of wondering how long, if ever, it would take for this condition to improve. ​My sister has struggled with migraine headaches for many years. She has seemingly tried everything. Quite by accident she read about almonds having an effect for some people. Now when she feels a migraine coming she eats 15 almonds and many times it never becomes a headache. She finds this pretty amazing - so simple a treatment - after so many years of suffering. Many times I see clients who have endured much time with a painful musculoskeletal condition. Sometimes I can help them in 1 or a few sessions to get rid of or significantly reduce the pain. Sometimes it takes a long time and sometimes I cannot help them so a referral to another discipline is the right course. It can be hard to wait for a positive effect with natural treatments. It is always a game of finding what works and giving it enough time. This really is the same with standard medical care, though, because, although the treatments are powerful, they don't always solve the problem right away either. But when a good natural solution is found it is nice to work in harmony with the body. I have been interested in buying a real human skeleton for the school for many years. I first became introduced to real skeletons and what they can teach us way back in high school when my teacher for medical biology showed the class two real skeletons the school had borrowed for a time. He showed us how the bones held information about the individual and how the life they once had affected them. One was female with a wide pelvis, big and round for childbearing. The male skeleton could not have passed a baby through the pelvis. Now that I study and teach anatomy I really could see the benefit of the school obtaining a real skeleton. I found out through online research that it is legal to own human bones, especially for anatomy study. The problem was the expense. Human skeletons were commonly produced and imported into the U.S. from countries like India and China until those countries banned this practice (1987 for India, 2008 for China.) Now the values of human skeletons already in the U.S. have risen due to scarcity. Also many of the skeletons here are older and have suffered damage so finding a skeleton in good condition for a reasonable price is difficult. I saw prices many times in the $5000 range for a complete skeleton in good condition. This was just too much for WSMT to pay. But I kept watching online auctions. In January a skeleton was newly listed on ebay that met my requirements for quality. It was a complete skeleton in good condition with the added bonus of having been professionally painted with muscle attachments labeled. This feature alone often adds an additional $1000. The opening bid was $2200, but the seller would entertain offers to buy outright. I saw that an offer was already in the works by another buyer so I would have to act fast if I was going to get a chance at this one. Well, the other offer was probably way low, but no matter, my $1900 offer was quickly accepted! The seller usually handled coins so he didn't really know what he had especially when it came to shipping. He underestimated the cost to ship especially when he realized that a cardboard box was going to be too precarious for such a fragile item. I'm thankful that he bought a big plastic bin. He disassembled and wrapped each part in bubble wrap and labeled the box as fragile. The skeleton arrived in great shape and the seller informed me he lost money shipping it to me, but I thanked him profusely and I tried to make him feel better about getting this great learning tool into the hands of a school where it could be appropriately appreciated. I unpacked the skull and torso at school just to check on it and Robin and I fawned over it in amazement. We are truly anatomy-geeks! I could see, though, that it was quite dirty, coated with about 1/4 inch of dust. I contacted the seller again for any background of the skeleton's origins. He said he got it at auction and that it had been owned by a very eccentric older man who just had it in his house. Well, that explains the dust. I'm guessing he bought it from some school that was clearing out older material or he had been a doctor and had this specimen in his professional collection. So I had a cleaning project on my hands. I found out hydrogen peroxide is the solution of choice for this job. I set up a table with a good lamp overhead and laid out the parts. I wiped over every bone with soft cotton dipped in hydrogen peroxide. It came pretty clean easily. One advantage to this procedure is that I looked carefully at the whole skeleton. I got quite an education right there! In May we held an alumni reunion night to unveil the new skeleton. It was a great draw for a lot of graduates to come and see real human anatomy. It is great to have this complete specimen available for study at the school. I've come full circle, having first been introduced to the skeleton in high school to now purchasing one for the school. WSMT is a school that takes education seriously. We make investments like this to make a massage therapy education deep and satisfying. This is one reason WSMT is such a leader in this field. Massage therapy education is all we do. This past Tuesday we held a new continuing education class for massage therapists. Using deep pressure in massage work is fraught with technicalities. Many clients request deeper work. Therapists struggle to meet these requests, and they have questions about determining when it is appropriate, why it is a good idea for some clients, and how to achieve deeper pressure work in ways that are safe for the therapists' bodies. This class helped participants get answers. We learned to calibrate our pressure, communicate better with clients, and even use the tools of our bodies correctly. 2 clients came in to model and their feedback was essential to gaining a comfort level with this work. I learned that for some therapists the fear of working too deeply is great. This area of advanced training proved to be very interesting and immediately useful to the class participants as all gave the class top marks on their written surveys of the class. We look forward to offering the Deep Pressure class again in November and all massage therapists are welcome to attend! Is It Ok to Swear in a Professional Setting? So, is it ok to swear in a professional setting? No. It’s plain and simple. I like the quote above by Shannon Alder. I think she hits it on the head. Do I ever want my clients or colleagues to possibly think I’ve lost my class and control? Absolutely not. Class says to me that I am a person who has high standards. I dress professionally, I conduct business with integrity, I speak clearly and calmly, and I strive for the highest quality professional work I can do. Control says I am a person who can be trusted because I can control my emotions, my temper, and my impulses. I do not want to be around people who have lost their class and control and I don’t expect anyone else to either. About a year ago I tried out a new doctor. During our consultation this medical professional used profanity several times and it took me aback. I have never experienced such language from a doctor before. I guess the standards of professional language are becoming more lax, but I didn’t find it comforting as a patient in any way. I think we owe it to our clients to present the best of ourselves and our fields with the clearest, most positive language we can. Swearing just doesn’t cut it in my book. As a result I find most people who swear a lot have little else to say, and generally aren't worth listening to. If you can't make your point without swearing then you're a poor communicator. If you need to use profanity to evoke emotion or any sense, you've failed your audience. You want to shock them? Do it with an idea. I've generally found that swearing was a cheap way to try to connect and communicate. It's high fructose corn syrup speech. It's a cheap gimmick to evoke passion and a feeling of candid communication, but without expressing the idea in a way that speaks for itself. These people bring out another angle on the topic; that swearing makes one appear less intelligent. Since speaking and thinking are virtually one and the same, choosing the easy way out, to swear, indicates you are unable or unwilling to find a more precise word or idea to express. Hmmm…definitely not what I’m going for when I speak professionally! To Cut or Not to Cut, Should I Have Surgery? I get this question sometimes and I do not answer it! The decision to have or not have surgery is complex and should be carefully considered. Your doctor and your surgeon have important opinions about your condition. Primarily you must find out if avoiding or delaying surgery would pose a danger to your health or life. Then you must determine how much discomfort you can tolerate. Natural treatments, if they work, can take awhile. On the other hand, surgery can come with long healing and rehabilitation as well as risks of complications. I had a client who underwent a very easy and successful shoulder replacement, getting him out enjoying golf again. He quickly made the decision to have the other shoulder replaced too. This second surgery did not go as well, resulting in a very painfully swollen hand that lasted many months. Another person had the rare complication of nerve damage with hip replacement surgery resulting in pain in the leg possibly for the rest of her life. Even with successful surgery there is usually a recovery and rehabilitation time and schedule, but it is often the solution a person needs. So the bottom line is there is no easy answer to this question. A massage therapist can often help you to determine if soft tissue therapies can help alleviate or manage a condition, but we cannot tell you whether surgery is right for you or not. My advice? Gather the information you need and then make the decision that is right for you. Massage therapists can contribute to your information-gathering, but no one should make the decision to have or not have surgery but you. Gulp. The potential student sitting in front of me made this statement. She said this after saying that our facility is surprisingly nice and very professional. I must say I was dumbfounded. As the webmaster for our site I was immediately VERY interested in the explanation. Unprofessional was not the impression I am going for with this website! Well, I let out my held breath as she went on to say that compared to other sites she'd explored, ours was user-friendly, and uncluttered by extraneous advertising. She said she could actually find exactly what she was looking for: the schedules and the tuition costs. So, maybe not unprofessional, but uncommercialized? Yes, she said, that was definitely what she meant to say. This was music to my ears because I work hard to create the experience this person had on our website. I want you to find the information you need quickly and easily. WSMT will never hide our tuition from you. We are proud to offer such value for one of the most economical tuitions in massage education in the whole area. How do we do it? Concise curriculum focused on solid basics so you can choose your own advanced training later based on your interests and your client needs. Tuition is kept low by efficient use of our space, modest clinic fees for clients, and one program only: massage - the tuitions we collect only support our one focused mission. We would love to give you a free tour and answer all your questions! This week we held our first continuing education class for professional massage therapists on the use of tools. I have been working on writing a book on the topic since the beginning of the year. Many developers of tools have graciously sent me samples of their tools. And finally this week was the first class giving MTs the training and experience they need to use tools in their work. When used well, hand tools can make our work more effective for our clients and even more enjoyable for us. Of course excellent body mechanics are still crucial, a set of skills already very important in our basic curriculum. So, the class began with a review and a tune up of these skills. Then we could layer onto this base the skills needed to use massage tools. Participants were surprised at how much pressure they could produce with much less effort than they usually need to use. They were even beginning to be able to sense the tissue of their partner through the tool. This is exciting because it shows a shift in the brain of processing the sense of touch in a much different way than directly through the skin of the hands. The bottom line? It takes coaching and practice and time in this class to play with a variety of tools worked very well to gain an ease of use. Each participant left with the names of tools to obtain that they know will work for them rather than wasting money on tools that end up unloved and unused. The class is offered again in December. Why not consider a present to yourself at that time to add something new to your practice for the new year? We are now signing up students for our October Night, and September Day classes. The sooner you begin, the faster you will be a Wisconsin Licensed Massage Therapist with great job prospects, dedicated clients, and a steady income. Call us for a free tour at your convenience and on your schedule! 262-250-1276. 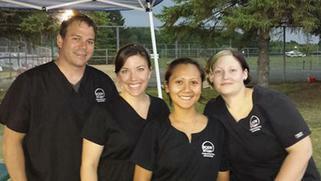 Our professional massage therapists take appointments with the public here at WSMT. The advantage to booking an appointment with one of our professional massage therapists is that you get the benefits of experience. Most of our therapists are also instructors at the school. People who are teaching massage therapy for us are at the top of their professional game. They are knowledgeable in human anatomy and physiology and skilled in many techniques to help you achieve your goals. Clients often celebrate the beauty of lower stress, less pain, and better sleep among other goals achieved. Often this can happen with flexible scheduling and less cost than a lot of providers who want to commit you to a year-long contract of monthly 50-minute massages. Today I want to highlight Miriam Mitchell, one of our main Theory & Practice instructors. Miriam's schedule now allows her to take more individual clients at the school. So for a short time we are offering a very special price for new clients' first appointment with Miriam: $40 for a full 60 minutes on the table. Miriam enjoys providing relaxation massage, therapeutic bodywork for pain issues, hot stone therapy, and on-site chair massage. We hope this introductory rate will interest you in booking an appointment with Miriam today. The best way to do this is to call her directly at 414-630-5855. Miriam's schedule is sure to tighten up with new clients. Why not call right now to secure your spot? Finding a good massage therapist can be compared to finding a good physician. Both work in the healthcare industry and the great ones truly want to help their clients. They do this by becoming educated in their field and use the latest knowledge by listening and providing the best treatment they can access in order to help their clients. And when they cannot provide the help their clients need directly, they know the correct type of specialist(s) that they can refer their clients to. Most licensed massage therapists (LMT) do want to help and focus on therapy. Massage is a female-dominated field, with a mere ~18% male population of therapists in the industry. Being a male LMT, I know that many people in my field have the mindset and passion to want to help facilitate healing and I certainly do as well. We have our clients’ best interest at mind and show it by communication and professionalism. When I massage clients, I do my best to paint a clear picture of the goals that my clients want for the massage then give the client a summary of what they can expect for the treatment for not only the current session but also beyond. I focus on proper draping and only talk when the conversation is led by the client or when asking the client about pressure or treatment-related questions. I have experience with all ages, races, body types and genders. It does not matter to me who I am treating; my focus is on the client's goals for the session. It is unfortunate that a few unprofessional therapists, especially males, have painted a stigma for this important and growing profession, so I would like to take some time to provide potential clients with proper education and some background about me specifically, to help set people's mind at ease. For nearly the past decade, I spent most of my working hours in restaurant and retail management. Being in middle management, I made minimal money with maximum stress and work-load. After a rough few months with my former employer I decided it was time to go back to school to improve or even change the focus of my career. I wanted a career where I could help people and spend more time with my family. I was looking at various brochures and websites from community colleges and trade schools. One memorable day during this exploration period, my wife came home from a wonderful massage. She has battled chronic neck and shoulder pain mostly due to having thyroid cancer in her neck when she was young, also because she still battles Hashimoto’s Thyroiditis, works at a computer for 8-10 hours a day and copes with work-related stress on a daily basis. I wish I had a before and after picture of her before she started working with her massage therapist. She just had a glow to her that I hadn't seen in a long while. This was the seed that was planted in me. I was looking for a flexible, well-paying career that could help people! I did more research on massage schools and careers in massage. About three months from that life-altering day, I started school at The Wisconsin School of Massage Therapy. My class was the first male-dominant class for the school; four men and three women. I am certainly not alone in becoming interested in this very important and emerging field for not just women, but now for men as well. I am thankful that massage is becoming a recognized health profession and am proud to be a part of that community of professionals. I can only hope we can take the profession one step further and become more focused on hiring LMT's based purely on professionalism, not gender. Thanks, Brad, for an eloquent piece. Men often bring natural strength to massage work in addition to knowledge, skill, and caring. I always prefer a male therapist if given the choice! Brad has a great job at BodyWise Therapeutic Massage LLC, in Kenosha, Wisconsin. We wish you all the best, Brad! We are very excited to offer prospective students another section of our professional massage therapy training class! We have opened up another night session beginning in November to accommodate those whose schedules are not free during the day. Many students tell us how thankful they are that we offer night school that works with their busy full-time working or family schedules. See our calendars page for all the upcoming options. Some are very quick - 6 months! Others are longer, but with less demands per week. You pick the schedule that fits your life! • "Gave me techniques to use so I don't have to use my thumbs." •"I will come back next year!" •"Mary is wonderful, she really knows her stuff! I really liked that there was no such thing as a stupid question." •"I love Mary's teaching, she's very thorough, fun, and she makes the class interesting." "Graduation day today! 10 months ago I didn't realize I would enjoy going to massage therapy school so much that I'm actually going to miss it, and the ladies in my class! However, it'll be nice to be out in the real world helping others, it's a very rewarding feeling!" "Mary, Robin, Lisa, & Miriam - Thank you for this amazing school experience! I can't wait to use my skills and knowledge you all helped me achieve! Thanks!" We are so proud of our most recent graduating class who were quite a delight for us. Every group comes in at the beginning quite disparate; some are older some are younger, some have always been good students, some have struggled in school, some are more outgoing, others are shy. I greet every new class the first day and I feel the slight nervous tension in the room. Inside I just smile because I know what is likely to happen within a few days: a melding. The groups of students become little communities of their own where each member is cared about. We consistently get sentiments like those above from our graduates. It is always a bittersweet day; that graduation day when their schooling with us ends. We love to see them go out into their new profession, competent and confident, but we know we will miss them. It is so gratifying to know they feel the same! The entire staff at WSMT wishes the November 20, 2014 graduating class all the best!! 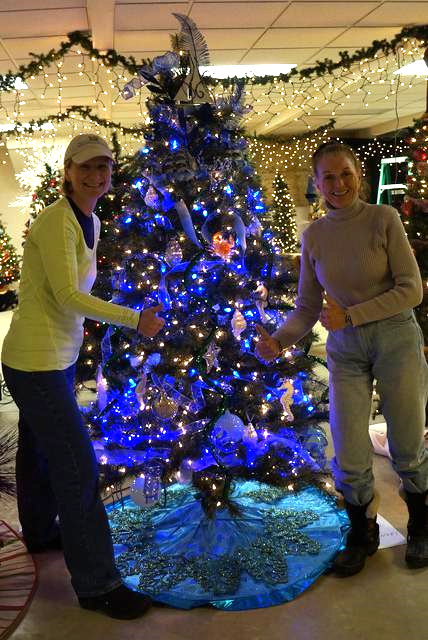 It's that time of year again for the Washington County Humane Society Festival of Trees. WSMT has contributed a tree again this year. Decorating was today and Rosi Tomaz and I spent about 2 hours putting it together. Our theme is, "I Saw 3 Ships A-Sailing." Next weekend, December 6th and 7th, all the trees, swags, arrangements, wreaths and the boutique will be open for a visit. Come out and kick off the holidays by giving to the needy animals of Washington County who desperately need your help. Why does WSMT donate a tree each year? Well, partly because I wouldn't have my 16 year old dachshund, Hudson, without them. Also, because every time I walk into the humane society and see the big eyes behind the kennel doors I am moved. Living creatures shouldn't be thrown away, abandoned, and abused in my estimation. I want to support this work of saving and restoring these wonderful animals back to full lives in loving homes. Go on out and visit. It's only $6 for adults to go in and look at all the amazingly creative trees and decorations. The trees are all raffled off for a song, too, so if there is one that catches your eye you can try to win it. Maybe a tree with 3 ships as the topper?! WSMT has a good supply of Comfort Pillows right now. A fabric bag filled with rice makes a wonderful winter gift. 3-5 minutes in the microwave warms up the rice and releases the moisture in the grains so the pillow gives off a nice, consistent moist heat for about 30 minutes. I recently gave one to a friend who was having trouble falling to sleep because of her cold feet. She has told me the rice bag has been, "Life changing" because she tucks it down at her feet at night and falls blissfully asleep without problem. The weight of the rice is nice, too, for achy necks/shoulders, and tight forearms and hands. WSMT provides one of these pillows to each student to use as both a breathing exercise tool (on the abdomen it provides just enough weight to challenge the diaphragm) and as a heating element in their massage work (wrapped in a pillowcase or towel for hygiene). I take one to bed most winter nights and even my dogs curl up with a hot rice bag in winter! We do have extras at the school available to anyone for $10.